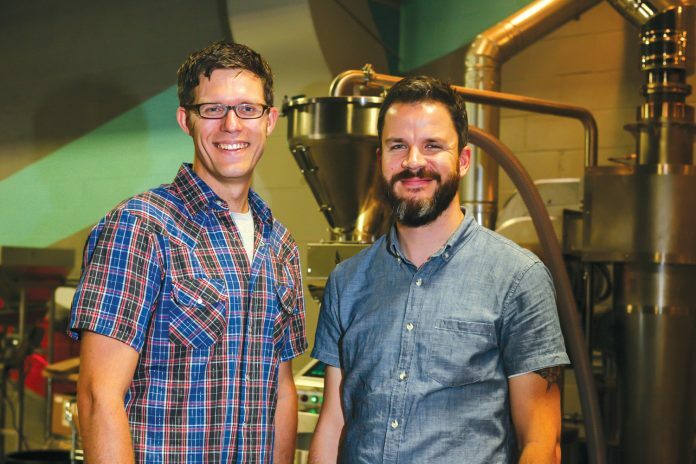 Peregrine owner Ryan Jensen and Small Planes head roaster Evan Howe. This coming week Peregrine Espresso marks ten years of serving fine coffee to the residents of the District of Columbia. To celebrate this milestone, all Peregrine Espresso locations will be serving complimentary drip and iced coffee all day Wednesday, September 5. Since their doors first opened on Labor Day weekend in 2008, Peregrine Espresso has been known as a standard-bearer for quality specialty coffee. Peregrine was one of the first progressive coffee bars in DC, distinguishing itself as the first coffee bar in DC to offer an extensive menu of coffees brewed fresh via pour-over and also to incorporate seasonal specials on their menu. Peregrine Espresso has been recognized nationally by outlets such as Food and Wine, Bon Appetit, USA Today and The Daily Meal. On September 5, Peregrine Espresso locations will be serving Huehuetenango, an exclusive Guatemalan coffee from Santa Barbara, as an anniversary drip coffee offering. The Arboretum blend will be featured as iced coffee. Both coffees are roasted in the District by Peregrine’s sister company, Small Planes Coffee. Guests will also receive two dollars off all bags of both Santa Barbara and Arboretum and the first ten whole bean purchases at each location will include a free Peregrine tote bag. Founded in 2008, Peregrine has three DC locations: 660 Pennsylvania Ave SE on Capitol Hill, 1718 14th St NW in MidCity and 1309 5th St NE inside Union Market. In 2017, founders Ryan and Jill Jensen also launched sister roasting company, Small Planes Coffee, near the National Arboretum at 2400 T St NE in DC. For more on Peregrine Espresso, please visit peregrineespresso.com email ryan@peregrineespresso.com, or follow @peregrinedc on social media.